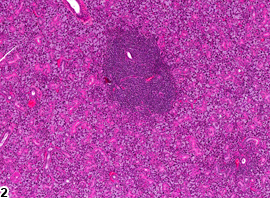 Salivary gland - Infiltration, Cellular, Lymphocyte in a female B6C3F1 mouse from a chronic study. 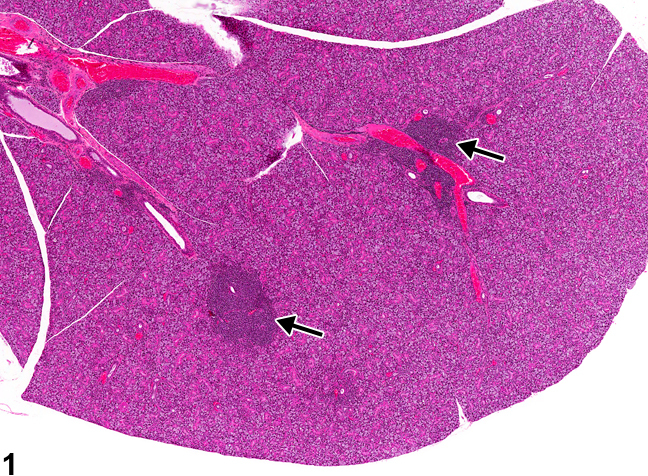 The cellular infiltrates (arrows) are more deeply basophilic than the glandular tissue. 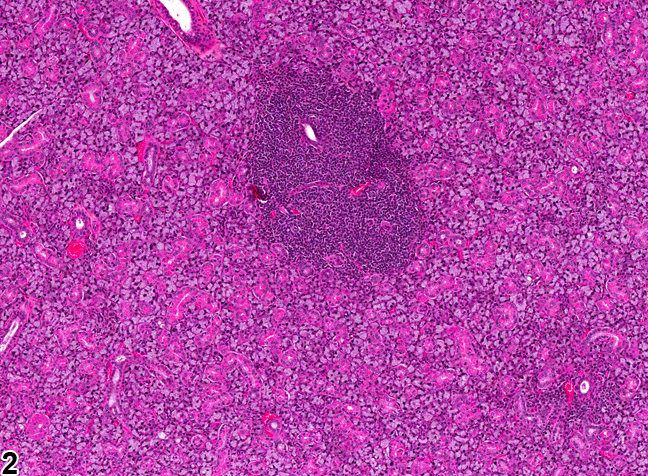 Salivary gland - Infiltration, Cellular, Lymphocyte in a female B6C3F1 mouse from a chronic study (higher magnification of Figure 1). The cellular infiltrates are composed mainly of lymphocytes. Infiltrates in the salivary gland can include small mature lymphocytes, eosinophils, mast cells, histiocytes, and nondegenerate granulocytes. Infiltrates of mononuclear cells, primarily lymphocytes, sometimes admixed with a few plasma cells, occur commonly in the salivary glands of B6C3F1 mice ( Figure 1 and Figure 2 ), as in other organs in the B6C3F1 mouse. The significance of these infiltrates in the salivary gland is unclear. The infiltrates may consist of a single or multiple clusters and are usually larger and more frequent in females. They generally begin in the perivascular space but may increase in size so as to infiltrate and displace glandular parenchyma. 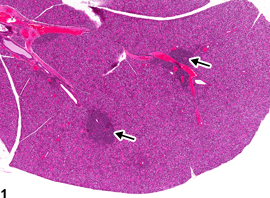 Foci of lymphocytes or plasma cells may be present in older rats undergoing age-related atrophy of the salivary glands. It is necessary to differentiate marked lymphocyte infiltrate from chronic inflammation and lymphoma. Chronic inflammation will also have necrosis and tissue damage, which are not noted with cellular infiltrates. Lymphoma would be expected to result in effacement of salivary gland architecture and to be present in other organs, as lymphoma is rarely primary to the salivary gland. Whenever present, an infiltrate of cells in the salivary gland should be diagnosed as recorded as "infiltration, cellular" with the appropriate cell type indicated (i.e., lymphocyte, eosinophil, histiocyte, etc.). Severity grading is based on the number of cells infiltrating the salivary gland. If lymphocytes (or other infiltrating cells) are considered a component of atrophy, they should not be diagnosed but should be described in the narrative with the atrophy. Botts S, Jokinen M, Gaillard ET, Elwell MR, Mann PC. 1999. Salivary, Harderian, and lacrimal glands. In: Pathology of the Mouse (Maronpot RR, ed). Cache River Press, St Louis, MO, 49-80. Greaves P. 2007. Digestive system. In: Histopathology of Preclinical Toxicity Studies, 3rd ed. Academic Press, London, 334-456. Neuenschwander SB, Elwell MR. 1990. Salivary glands. In: Pathology of the Fischer Rat (Boorman GA, Montgomery CA, MacKenzie WF, eds). Academic Press, San Diego, CA, 31-42.